Make your iPhone great again with this awesome iPhone 6 case. 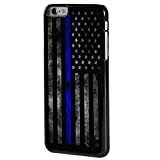 The case will protect your phone from scratches, dust, and other unwanted particles. Moreover, it will make your phone look badass and outstandingly stylish and modern. The design is eye-catching, bold and direct, showing off your love for the style but also for your country. 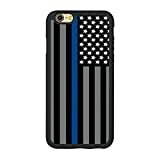 This is the best phone protection for a slightly overrated phone and a somewhat overrated country, unless Trump really makes it great again, somehow. 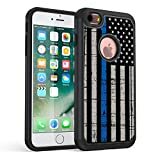 iPhone 6/6s Plus Case,BOSLIVE Old Retro Thin Blue Line American Flag Design Hard Plastic Cover Anti-Scratch Protective Phone Case Compatible iPhone 6/6s Plus 5.5"
Design Compatible With iPhone 6/6s plus 5.5"
Convenient Loading and Unloading.Light Weight, Durable and Protect.Easy Access to all Ports, Buttons, Controls and Camera Lens. Following can DIY, get rid of static, highlight your unique personality!You Could Also Provide Your Own Pictures, We will custom for you!